Wealth-X, which is world’s leading wealth intelligence firm, has just released their latest report on the ultra high net worth personals in India, and some interesting data has come out of it. As per the report, top 5 Indian business tycoons control almost 50% of overall billionaire’s wealth in the country. These top 5 business leaders collectively control $85.5 billion, which is 47.5% of India’s total billionaire wealth. – Mukesh Ambani, having total net worth of $24.4 billion. His company Reliance Industries makes majority of it’s wealth from Oil and Gas industry. His home in Mumbai: Antilia is still world’s most expensive billionaire home. – Lakshmi Mittal, having total net worth of $17.2 billion. His steel company ArcelorMittal is world’s largest steel manufacturing company. – Azim Premji, founder of Wipro has total net worth of $14.9 billion. He is the only technologist entrepreneur in the top 10 list of Indian billionaires. – Pallonji Shapoorji Mistry, chairman of Shapoorji Pallonji Group and owner of 18.4% stake in Tata Sons is having total net worth of $12.7 billion. Just to compare, India’s richest actor: Shahrukh Khan is having total net worth of $600 million and India’s most popular sportsperson: Sachin Tendulkar has total net worth of $160 million. The report observes that entrepreneurship holds the key to achieve financial success in this country of 1.25 billion+ people. Reportedly, there are 103 billionaires in India right now andMukesh Ambani is the richest of them all. Collectively, these 103 billionaires have personal assets worth $180 billion. This makes India the 5th largest group of billionaires in the world. As of 2013, India had 7800 Ultra High Net Worth individuals (UHNW), who collectively owned $935 billion in personal assets (UHNW are those personals who have their personal net worth of more than $30 million). Within Asia, we are behind China and Japan in terms of total UHNWs and their assets. Interestingly, Wealth-X also mentions that Indians are among the most generous rich in the world. Between 2010 and 2013, all the UHNWs in India have donated 10.3% of their overall wealth to charities. You can see the list of all Indian billionaires and their total worth as calculated by Forbes here. 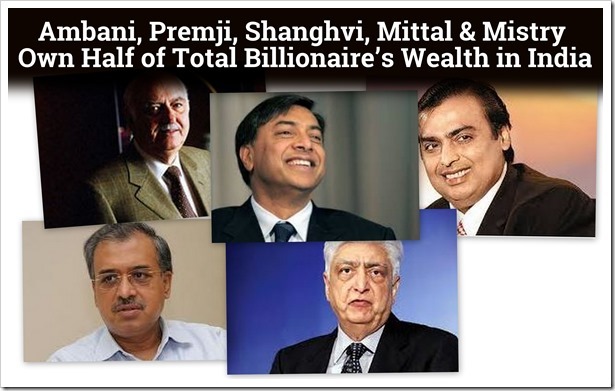 "Ambani, Premji, Shanghvi, Mittal & Mistry Own Half of Total Billionaire’s Wealth in India", 5 out of 5 based on 1 ratings. Use This Mobile App To Bring A Social Change In India: Stop Child Trafficking Now!